Marketing in the eyes of CMO’s is becoming increasingly complex. Embracing this complexity is not easy, as it requires changes in your organization, skill-set and technology. Embracing this change requires a digital marketing transformation. But it’s a necessary change: the technology revolution and the increasing power of large dominant internet players are forcing modern CMO’s to rethink their strategy. What complexity environment is entering the world of CMO’s? Give your broadcast team a problem to solve and the solution will be a TV spot. Give that same brief to your SEO guy and he’ll do it with AdWords and metadata. Departments are used to only think and work on one single element of the customer journey. Sales does sales. Logistics does logistics. Projects do projects. And customer service does customers service. That’s natural behavior, but it reinforces silos. Within a silo, teams can only do so much as it is able to control. But in a digital world, where customer have all the power, marketing must think of ways to bring one customer experience along the complete customer journey. Customers expect sales to know about customer service. And customers expect customer service to solve sales issues. Systems, processes and the organization in general must be changed to answer to these challenges. The end-result is a customer centric organization. Many companies struggle with this customer centricity as part of their digital marketing transformation, because it’s bigger than what one single department can handle. It’s cross-departmental. So you need attention to higher layers that function across the complete company (data, tools, organization, change, etc). Developing this higher layer is not a simple job. Many have tried to implement the 360° CRM view, but have seen that it’s not that simple. Doing this kind of CRM implementations takes years of work, and by the time it’s rolled out, you need to change it again. People get tired, key people leave the company, and the once grande vision is reduced to serving the basic needs of departments. This is because we have been focusing on the tool and the value for our company, and not on the value our customers. We have been focusing on the dream of using the 360° customer data to improve customer service, improve targeting in marketing, to improve the follow-up of customers, to better identify growth potential at customers, etc. But we forgot the most important thing: we haven’t thought about how the tool can help customers save time, help choose, get surprised, remove touchpoint friction, etc. So how do you get organized for customer centricity? Becoming customer centric today, in the age of digital technology, has a different meaning than 100 years ago. 100 years ago customer centric meant that the clerk in a shop knew your name, and recommended a new product to you because he knew you well enough to understand your needs. Albeit different in the digital technology age of today, much of that aspect to personalization is required today. What is different today is that we need to bring that personalization on a much bigger scale. Focus on High Value: Understand what customers want to achieve. What task do they want to perform ? And then focus on bringing a high value for customers, in the context of what customers want to achieve. Freedom of channel: customers must have the freedom to shop online, or spend more in-store. They should have the choice to talk to someone right now via chat, or via email. But a call to the call-centre should reveal that chat and email conversation. When automated emails go out, people should be able to reply to that email instead being bounced-off of the usual “no-reply” email address. Bring experiences that relate to your products: a retailer could provide cooking classes that use products of the retailer. A B2B high tech company could organize webinars that educate customers on trends. Car dealers let customers know when it’s time for a tune-up. Ben & Jerry’s has their Free Cone Day to celebrate the opening of their first store. Invite guest bloggers and influencers to VIP treatments and ask them to share that experience. Personalize offerings to individuals: collect customer information, and analyse for better insights. Stitchfix uses data to personalize offerings to women, and collects feedback about the reaction to these offerings to further tune to their needs. Create personal emotional connections: little things matter. Human connections matter. Introduce random-acts-of-kindness, funny call-to-actions, employees that write handwritten personal notes to customers, etc. Co-creation or designing products with customers: gather product ideas from customers and let them vote on the best ones. Invest in good user experiences that fit your brand: is your website or mobile design and UX in line with your brand promise? if the online or offline experience isn’t up to par with your brand promise, how can customers ever trust that your products or services also will deliver what you promise? The latest wave of customer centricity thinking is designed to create a mind shift in approach to solving a company’s most pressing problems, focusing on the outcome, and working backwards. In an interesting slide from Janne Ohtonen on his Slideshare , he shows a way to structure your organization based on the customer, starting from target customers, moving to what customers want as outcomes, and then link that to activities that are done in an organization. In my previous post on digital marketing organization structures, I’ve taken a similar approach to focusing on tasks that customers want to perform, but this time aligned along the customer journey. By aligning your organization along the customer journey, the whole organization and it’s resources are focused on the customer and their needs. An example of an organization structure organized by the customer journey. For those that regularly read this blog might remember that I’ve previously wrote about the slipstream of new marketing concepts. Organization that adopt new marketing concepts have the benefit of the “slipstream effect of change“. In the slipstream of adopting new marketing concepts like content marketing and personalization is a wave of change going through organizations that adopt these new concepts. Think of agile marketing teams, content teams, customer journey designers, program managers, and chief digital officers joining the organization chart and more. But also new technologies like marketing automation, big data, AI and more. In an article published in HBR on Customer Journeys, David Edelman pitches a new role within companies called Journey Product Managers. It’s an interesting new title to a role that usually covers integrated campaigns or marketing programs. David Edelman adds the element of business responsibility. These people are really hard to find, as they need a broad experience and an impartial approach to life but the result is golden. But as we all move more and more into the digital age, let’s hope these roles become more common and easy to find. Digital marketing transformation is about culture, processes, technology, but most certainly also about organization. Depending on your company size, company set-up (business units, teams, regions and countries), internal structure and maybe internal politics, you’ll need new roles of people that do different things. Internal discussions on new concepts and new trends. Classic marketers might struggle with the digital mindset of agility, experimentation and analytics. Not all of them will be able to make the transition. Maybe I’m wrong. Maybe it’s possible to re-educate people. Digital marketing transformation is impossible without the right backbone digital marketing technology. In the 1970s manufacturing required planning tools (MRP or material requirements planning), and the 1990s was a time of explosive growth for the technology, particularly with ERP software systems that were meant to integrate businesses processes throughout every functional area. “Purchase-to-pay” and “order-to-cash” were being incorporated more and more regularly. 2016 and the years to come are the years where companies are building their technology stacks and backbone digital marketing platforms. These platforms represent the core of your demand generation, lead generation and the digital customer experience your are bringing to customer along the customer life-cycle. They are part of a bigger integrated initiative that connect all the “dots” in your marketing technology landscape which allow you to haven an end-to-end vision on how your marketing is contributing to the business objectives. Social media, email, instant messaging, website technology, and all other customer touchpoint technologies are advancing with rapid speed. The danger is that by the time you have built your marketing technology stack, or architecture if you want, that it is already outdated by the time you launch your new technology stack. This liquid layers is the top layer in your technology stack: This top layer can quickly change, you can easily add technology, swap technology, remove technology. Think of CMS systems, advertising solutions, testing, video, search, feedback & chat, event & meetings & webinars, mobile tools, trackers, social media monitoring, etc. This top layer is loosely coupled with another layer which I now call the engagement technology layer. Typically we find marketing automation systems, sales automation, content marketing tools, campaign solutions, tagging & segmentation, e-commerce engines etc. in this layer. This engagement layers is somewhat stronger connected with business technology. Think of CRM, analytics, data management platforms, dashboards, data visualization, business intelligence, data enhancement, etc. 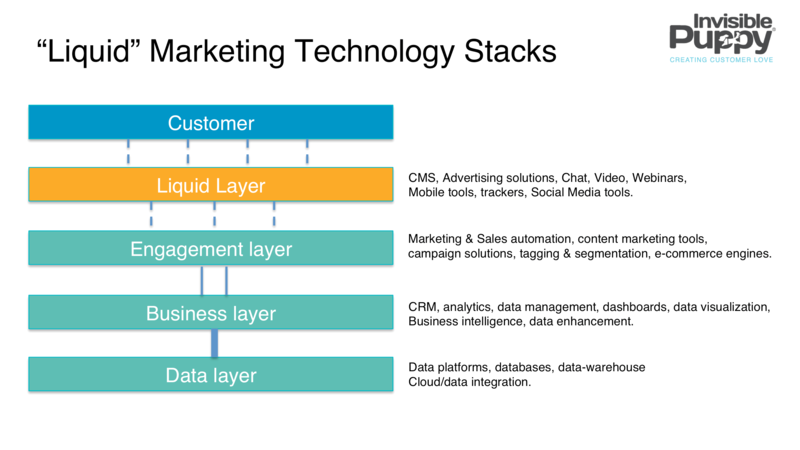 And the lowest layer, strong coupled with the business technology is the data layer. Think of data platforms, databases, data-warehouses, & cloud/data integration. Customers are tuning out traditional marketing methods, while consuming information and making buying decisions on mobile phone, tables, computers, smart televisions and wearable devices. The marketing industry is advancing at an unprecedented rate, creating gaps in marketing talent, technology and strategy. Although we are drowning in data, we are starving for insight. The next generation of marketing leaders will find internal support for this digital marketing transformation. They understand that it will require money, dedication, and time. The’ll leave their comfort zones, let go of their fears, and take risks. The will introduce new skills, change their organization, and introduce new technologies. But one thing is key: all the technology, skills or organizational change you introduce must bring value to customers. Without customer value, everything will fall flat. That is the key to modern marketing. P.S. That’s it for this one. Hope you liked it. Have questions about this? Something to add ? Let me know in the comment box or connect with me on social media. If you want more of this, make sure to subscribe to this blog.